I have to say, this was probably one of the worst nights I have ever experienced. The place we stayed in was, to put it lightly, definetely not what we had booked online. My brother Harri and I shared a double bed, and the room was so small that, in order for me to get out, I had to manouvre myself around Harri somehow. This was one practice which I happened to learn very well I think from the never-ending, sleepless night. To cut a long night short, my mum found me sitting up asleep on the coach downstairs in the morning. To leave the negatives aside, the pub owner gave us a lovely complimentary breakfast, ladened with English muffins, fruit and cereals. After eating a nice breakfast, we were all very happy to take the bus to the train station, and say good-riddance to that accommodation. Cambridge was my highlight of the whole trip. A life's dream turned reality is a special thing. I had great expectations for this quaint but world-renowned town, and anything I had imagined was surpassed. However, as we got off the train from Stanstead and began to walk into the centre of town, we all said "this better be worth it". The reason that I said this was, not because I was not completely happy to be in my dreamed college town, but because the day that we happened to arrive was sweltering hot. I know that this effected the mood of the women, since they were happy to head towards the air-conditioned shopping center rather than the glorious buildings we were here to see. Nevertheless, we all pushed on. And as we turned the corner, the amazing college-filled streets captured my eyes, like a pendulum, putting me in a trance. From then on, the sweltering hot miserable day turned into an enlightenment. The old, but amazingly maintained architecture was illuminated with rich and bold shades of yellow, orange, brown, rush and maroon, which shimmered when rays of sunlight caught the bright colours, and swirled when the heat caught the building off guard. Another fascinating observation was how this small university town was half-filled with tourists, who were inspecting the individual colleges with their unique styles and layouts as if they were set displays at a museum. This added to the exclusiveness of the colleges as they were seen as precious artefacts that were not to be touched or explored too deeply but merely admired for their grand structures and pristine-cut grass courtyards where one could not tread. 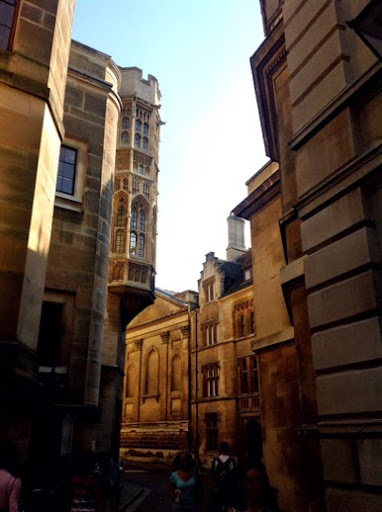 Walking through the grand entrance of one of the smallest colleges, Corpus Christi College, was an experience where I felt a sense of belonging. This is a small, close-knit student community, where I imagine the draws of intertwining studying, living and spending free time as completely magical. 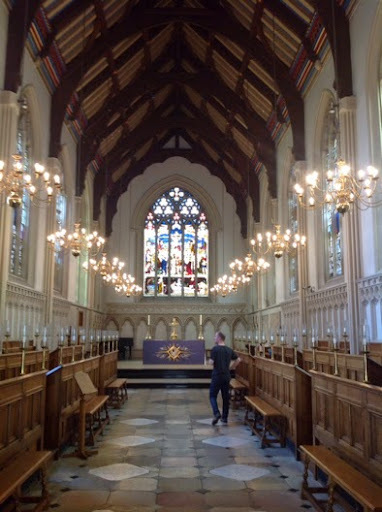 Each college has its own chapel, which is a great place to find peace in a hectic study environment. In addition, it represents one of the many amazing traditional aspects of the university that one can still seen today. We then continued walking through a passageway between the college buildings that rose up like grand statues. Everywhere we turned a new piece of architecture would catch my eye, and I would have to drag myself away again, and again, and again. 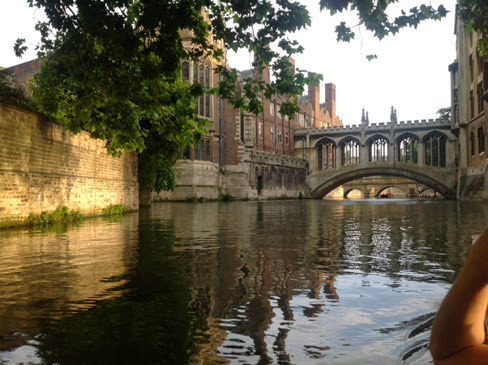 The highlight of the day was punting (punting is basically pushing a canoe-shaped boat with a long pole) down the River Cam and seeing the beautiful Backs, which is the official name for the back courtyards of the colleges. I think what I loved best was being able to relax in the much cooler evening, in contrast to the boiling day. 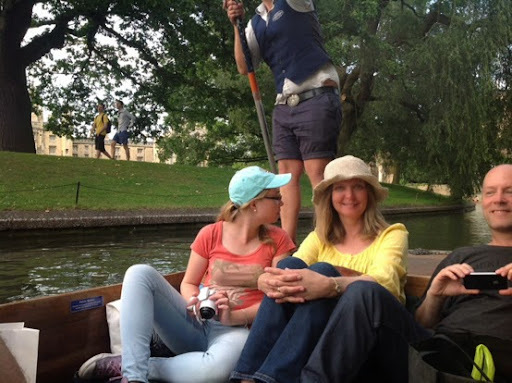 It was while punting that I could dreamily look in wonderment at all the colleges in the town that I hope may become my college town someday. Coincidentally our driver and tour guide was from Australia! He told us some interesting facts about the colleges, and the famous students that went there, from A.A. Milne to Prince Charles (who basically bribed his way in), Isaac Newton to John Cleese, and Charles Darwin to Emma Thompson. This bridge is actually a replication of the well-known Bridge of Sighs in Italy. 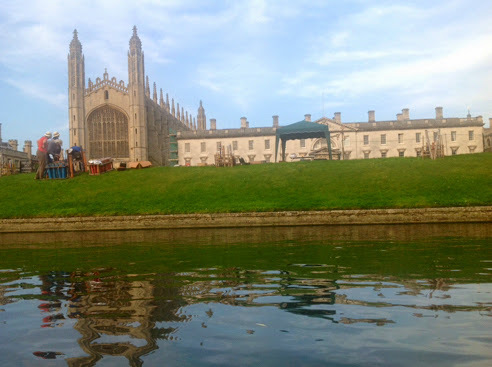 While floating past the amazing sights of Cambridge, we came across my personal favorite, King's College. I had actually left an image of this college I had found on Google last year as my screen saver on my iPad. However, nothing could quite compare to being right outside the college. Luckily enough, there were fireworks being set up for some sort of celebration just on the river bed, which took me back in time. 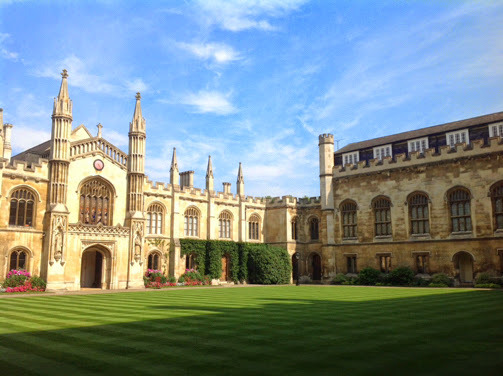 Hence, the most iconic Cambridge college happened to look like an antique picture! 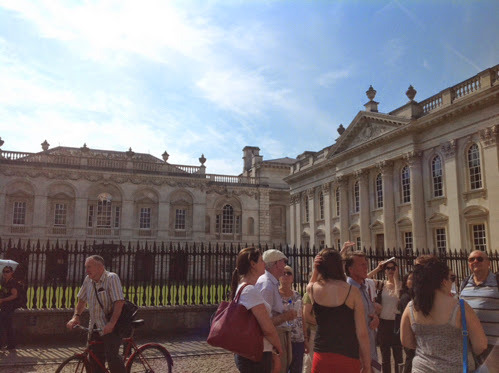 The tour guide, who was also the driver, told us about a cambridge "tradition" where the thrill-seekers climb the Cambridge colleges for the thrill of it. In one case, a foolhardy individual placed a witches hats on the the steeples of Kings College as a joke but also as proof that someone climbed one of the most amazing colleges (in my opinion) in the world. There is something about its being a mystery, where no-one knows who climbed the building, that makes it quite magical. Like something out of a movie. 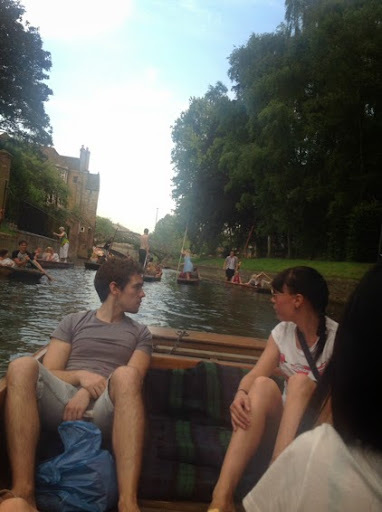 Hit a bit of traffic as tourists had a go at punting themselves. The three hot and bothered passengers that I dragged here could finally appreciate the beauty of Cambridge (it being much cooler in the evening). Overall this experience has opened my eyes to a window of opportunities that seem so much closer than ever before. The fact that it's a 15th century university town that has stood the test of time, and been the setting of the world's most accomplished names, says it all. Who wouldn't want to come here! Oh, and we went via Stanstead from York because the hotels and hostels in Cambridge cost a lot of money, while the hostels in Stanstead were much cheaper. However, once at Stanstead we still had to pay for a taxi to the hotel and back from the airport (where the train station is), so I am not sure whether it was a saving really. Signing off from such a magical town.